On a day that has not been seen in our industry in 10 years, we have created this page to collect initial reports and updates. It is upsetting when a single life is lost during a planned and organised event, the numbers that have been printed and reported today and tragic. 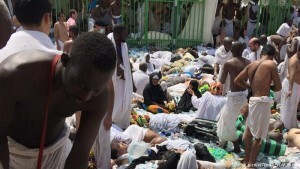 Saudi officials have denied reports that more than 1,000 people were killed in a stampede near Mecca last week while undertaking the Hajj pilgrimage.A Nigerian official told the BBC the bodies of 1,075 victims had been taken to mortuaries in the city of Jeddah – higher than the official toll of 769. Tragic incidents like the crowd crush that killed more than 700 people during the Hajj pilgrimage in Saudi Arabia last week are terrible accidents, but they don’t play out the way we might think, says one expert on crowd behaviour. The crush and stampede that struck the hajj last month in Saudi Arabia killed at least 2,177 pilgrims, a new Associated Press count has stated, after officials in the kingdom met to discuss the tragedy. A crush near Mecca last month killed nearly three times as many people as Saudi Arabia has admitted, according to a tally by the Associated Press (AP). 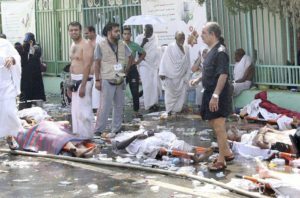 AP said on Monday that at least 2,110 people died in the tragedy at the annual Hajj pilgrimage – far more than the official Saudi death toll of 769. Stampede at Saudi hajj kills 717, leading to question: Why again? Crowd management: Have we seen the last of the Haj stampedes? According to the latest Associated Press report, the number of pilgrims to have died in the crush during this year’s Haj has now risen to 1,453. This makes it the stampede with the highest death count among all previous such incidents during Haj. A fresh tally of casualties killed in a stampede near Mecca last month has raised the death toll to 1,453, making this year’s incident the deadliest recorded during the hajj. More than 750 people were killed in last week’s stampede during the annual Hajj near the holy city of Mecca, but the exact circumstances of the tragedy remain unclear. More than 750 people have been killed and more than 900 injured in a stampede during the annual Hajj near the holy city of Mecca. My story comes from the Notting Hill carnival in 1999, though you may have your own. It was sunny and there wasn’t really a plan, other than to wander the streets and enjoy ourselves. Towards the end of the day, we came to a crossroads flooded with thousands of people. Like everybody else, we headed in. DUBAI/RIYADH: Pilgrims reported feeling the hands of their relatives slip away into the crowd on Thursday morning when a crush at the Mina camp in Mecca killed at least 769 in the deadliest hajj disaster in a generation. On Thursday, a stampede near the holy city of Mecca left more than 700 people dead, with hundreds more injured and the death toll still rising. The stampede, which occurred during the peak of the annual hajj pilgrimage, is just the latest in a regular string of such events at the site — but it’s the deadliest one in 25 years. 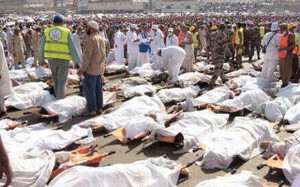 Today saw the worst tragedy at the Hajj in Saudi Arabia for 25 years, as 717 Muslim pilgrims were killed and nearly 900 injured in a crowd crush while on their way to the holy sites of Mecca. A crowd stampede that caused at least 769 deaths at the annual Muslim pilgrimage to Mecca provided a stark reminder of the safety challenges at the most congested public space in the world. The crowd crush at the annual Hajj pilgrimage in Saudi Arabia has claimed the lives of more than 700 people and injured at least 850 more.